Once you join the officer ranks, you’ll receive notifications upon logon about your skill level. Skill level goes from 0 to 200. If you have a skill level of 200 you’re supposedly a top player. The algorithm with which skill level is calculated is a mystery. Most agree that it takes into account the SPM (Score Per Minute), KDR (Kill/Death Ratio) amongst other metrics and factors. 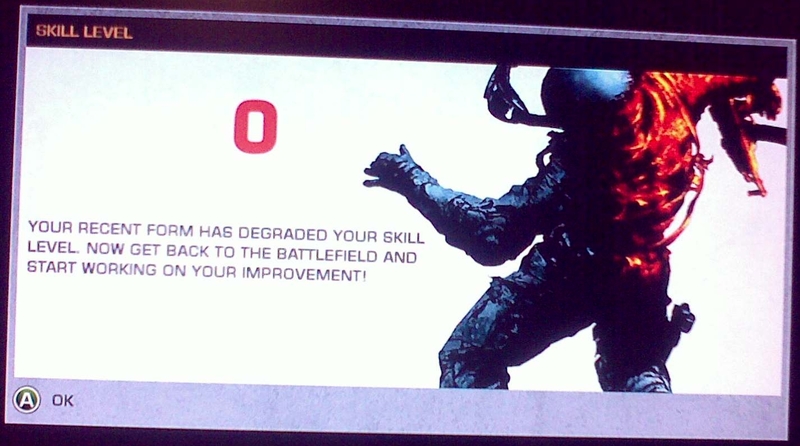 It has also been reported that if you don’t play for a number of days the skill level drops to 0 (…). UPDATE: The skill level does not increase if you’re off for a few days. In any case, you shouldn’t worry too much about your skill level because it doesn’t necessarily reflect your skills and how well you play. For instance, it is weird that DICE chose to partly base the skill level algorithm upon the KDR, since BFBC2 has been built in order to discourage players who are only interested for the kills, and this is one of the reasons why I/we think the game pwns Modern Warfare 2! Wish I’d taken a screenshot of my Xbox stats as I hadn’t played that in a week so I could have tested that time theory. From my experience, the wins/losses ratio is what matters the most for skill level. I have a bad W/L ratio some days. Instead, when i have a good W/L ratio and no good K/D ratio, i still get 199 skill level for kicks. My skill level dropped dramatically, and since then I have been playing solely squad rush in an effort to improve k/d ratio. Since playing in this mode I have found it easier to keep my k/d ratio positive, win rounds, and thus my skill level has peaked. I don’t know what they use to calculate it, but whilst I haven’t always been among the highest scoring (bearing in mind on ‘rush’ I am usually in the top 3 regardless of ratios) the k/d and w/l seems to have had a dramatic impact on skill level and I would guess these are the 2 biggest factors. K/D and W/L ratios are certainly the two biggest factors. I don’t like Squad Rush because you simply don’t have the opportunity to make enough kills nor to score enough. I like it because in my experience people make more of an effort to actually attack/defend the objective, and you have more of an idea who is where on the map generally.